This was a quick project, or it was supposed to be. I did have to recut the yoke when I realized that my stripes were not going to line up. Material is a Mill End Annex find, but it won’t be a favorite. I like how it looks but its very fussy to work with. At $5/yard it was worth some effort. Here is another Japanese book with some great simple designs. 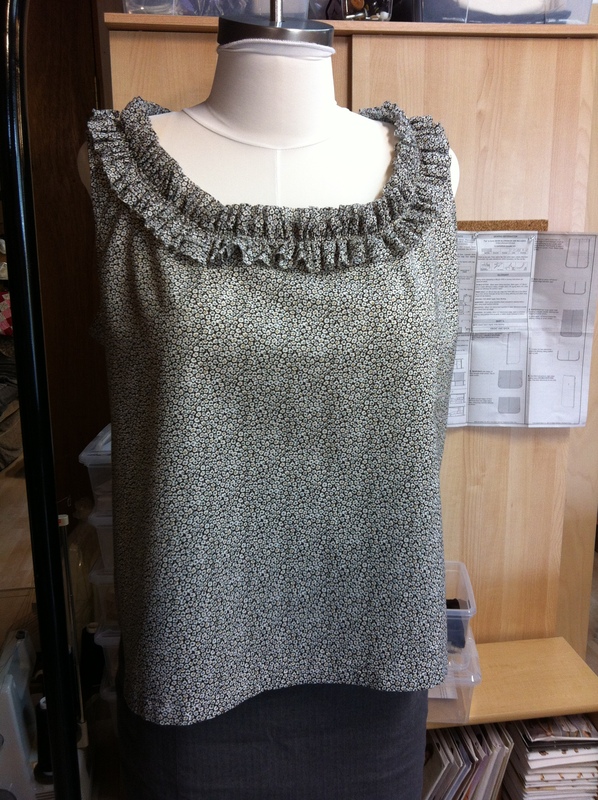 This was the first item I tried from the book, Simple Modern Sewing. 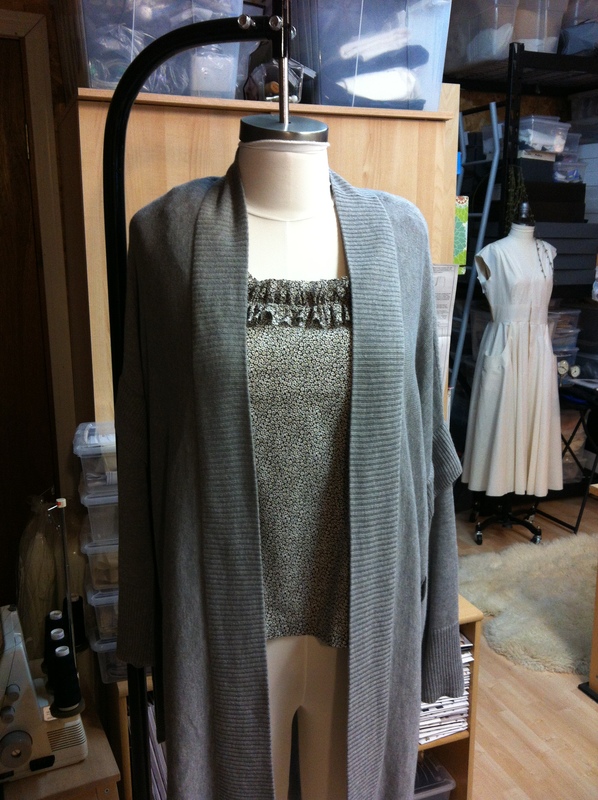 The fit wasn’t quite right for me, I enlarged the armholes and had to take a couple darts at the neckline to prevent some gaping once the ruffle was attached. This still needs some adjustment before I make it again. The size just isn’t quite right yet. 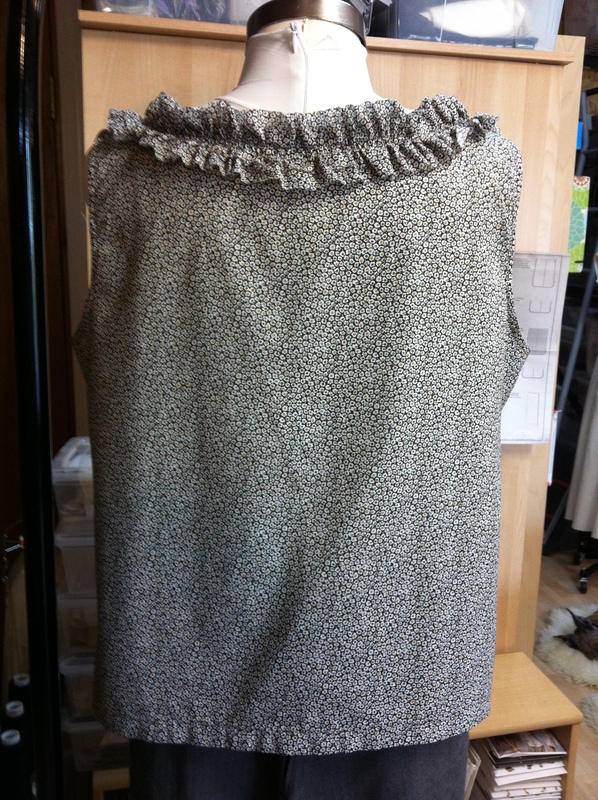 I do love the ruffle, and this goes together really quickly. Fabric is a cotton print from Bolt. I’m catching up on some long neglected blogging. On a good note, it’s mostly because sewing has been happening. There will be a swarm of catch-up on the completed pieces. Archer shirt from Grainline studios. 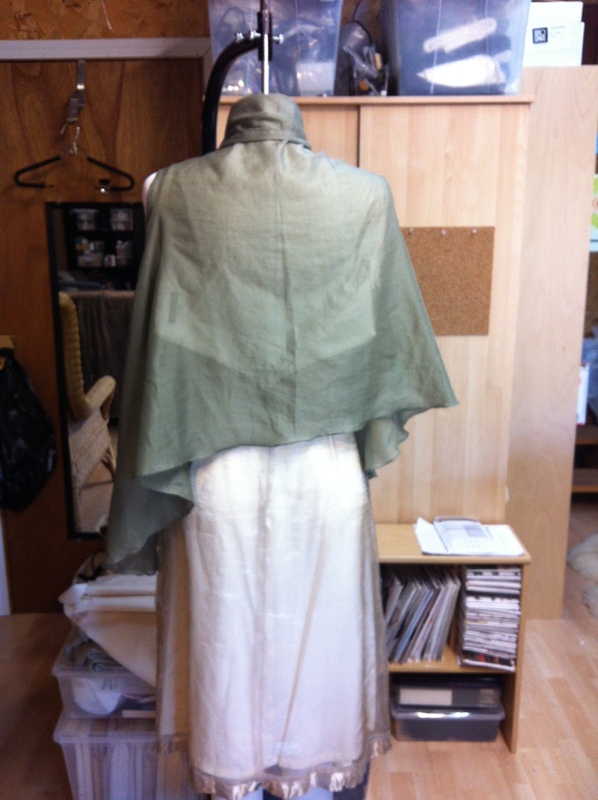 Two muslins later, I did get a fit I was happy with. The flounce backed version looked great on paper, but didn’t work well for my build. 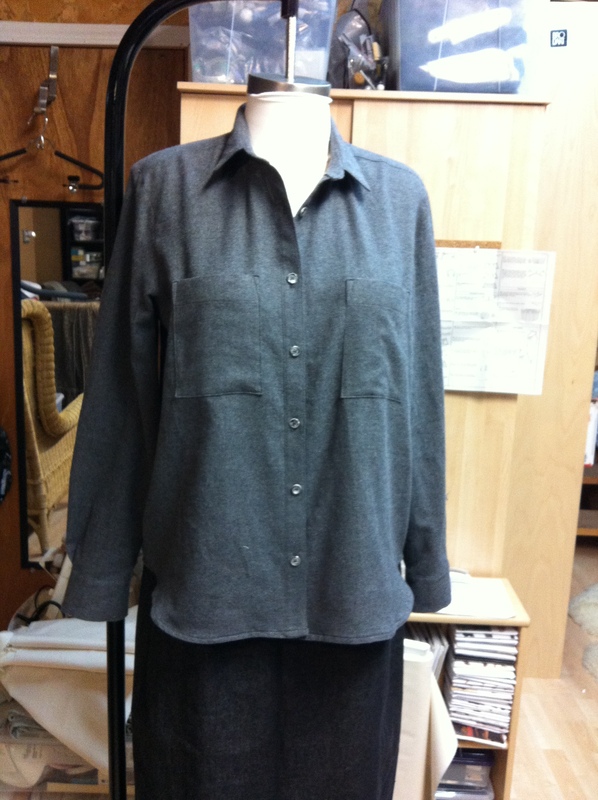 Material is a soft grey flannel from Mill End. 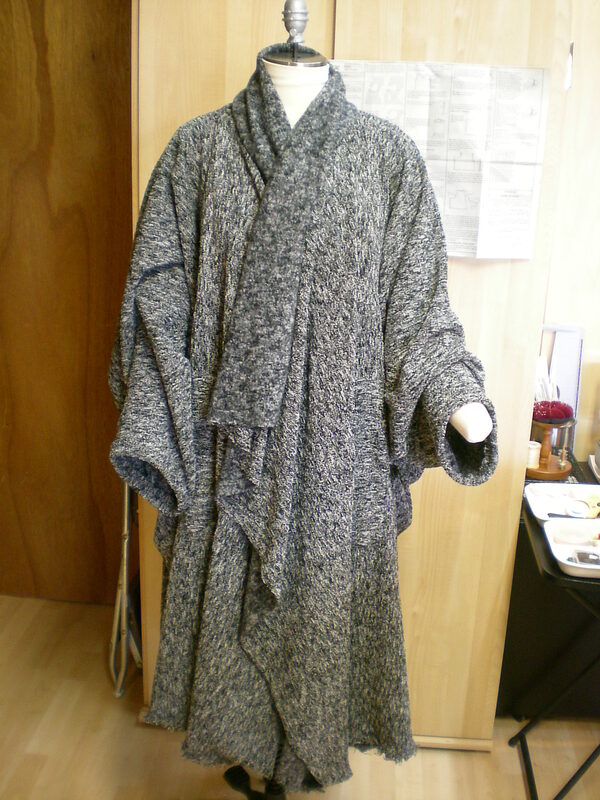 I would certainly make this one again, nice length and the arms were a good as is, which was a nice surprise. Here is the first pattern I’ve tried from Shape Shape . 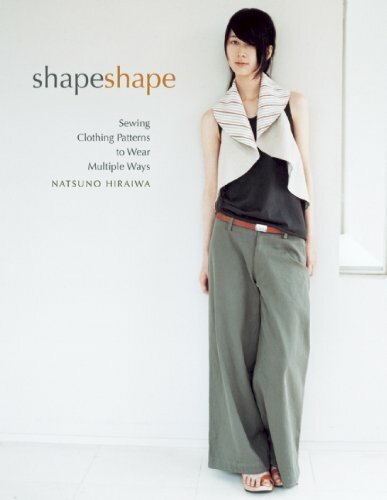 I love a lot of the designs in this book, but I will need to make some standard adjustments for any Japanese patterns. I just don’t have tiny arms, so all the armholes are quite snug. The tracing of the patterns takes some getting used to. I suppose I’ll be ready to trace out a Burda by the time I make a few more of the ones from these books. 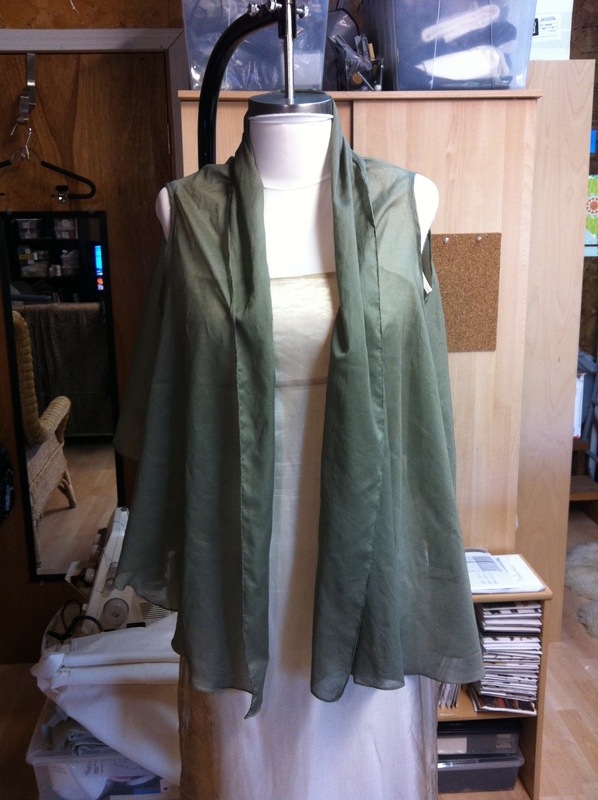 This is Pattern 6, the Free-Style Curved Stole. I did cave and go get the right presser foot for the tiny hem that I needed to get this done. This sat on the to do pile for a quite a while so I could delay the hours of pressing it was going to take to get the hem done all the way around. The hemming foot took all the pain out of the equation and the whole thing hemmed up in about half an hour. Armholes are bias bound, and could have been a little roomier. If I make this one again I will enlarge them some. Material is a cotton/silk blend from a clearance sale at Fabric Depot. Now that I’m back sewing more I will have to raid the outdoor sale more often. This really is a beautiful piece of fabric. I’m glad I finally found a nice way to make use of some of it. I’ve got a healthy piece left for another project to come. 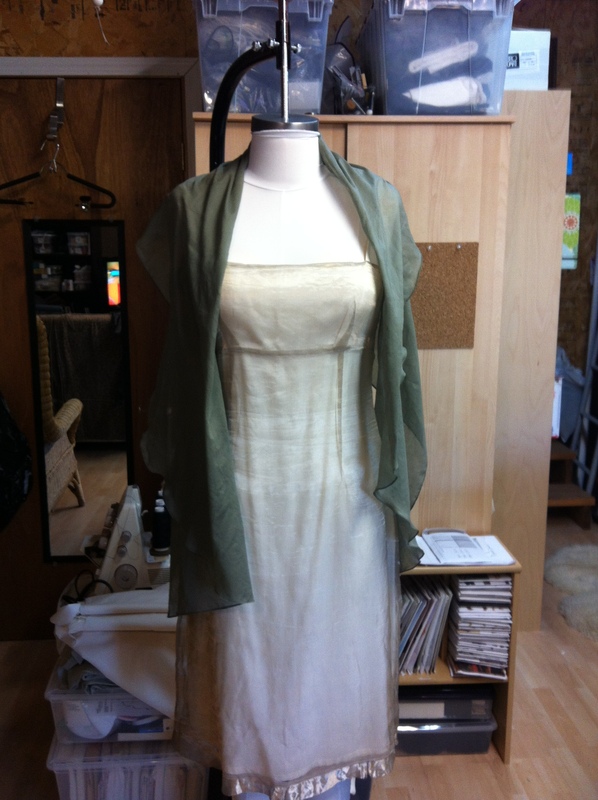 I’m still searching for backing fabric for the clay tiles quilt so I’ve been doing some fast garments in the meantime. One piece I just finished is from this pattern I purchased a few years ago. I’m simultaneously drawn to it, and repulsed by its absurd oversized proportions. 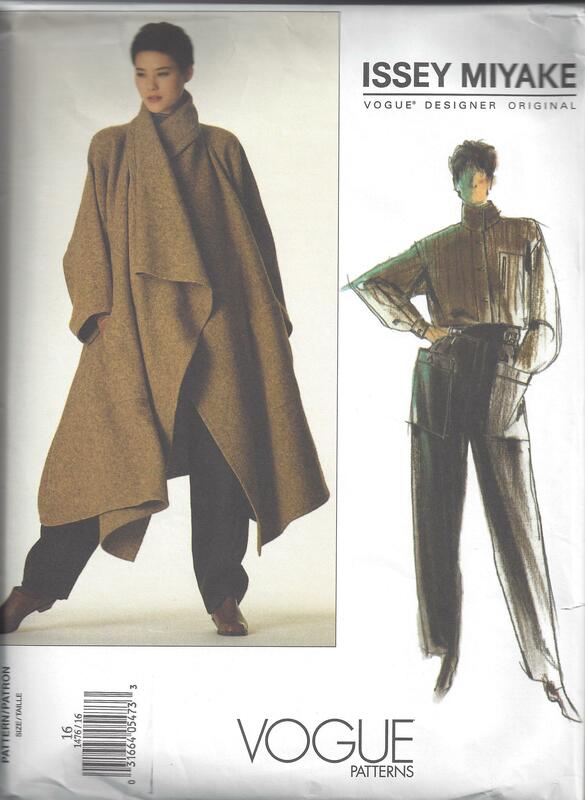 I really can’t imagine wearing it out in the world as a coat, but it makes a perfect solution as a sweater/blanket for my chilly studio/office space. 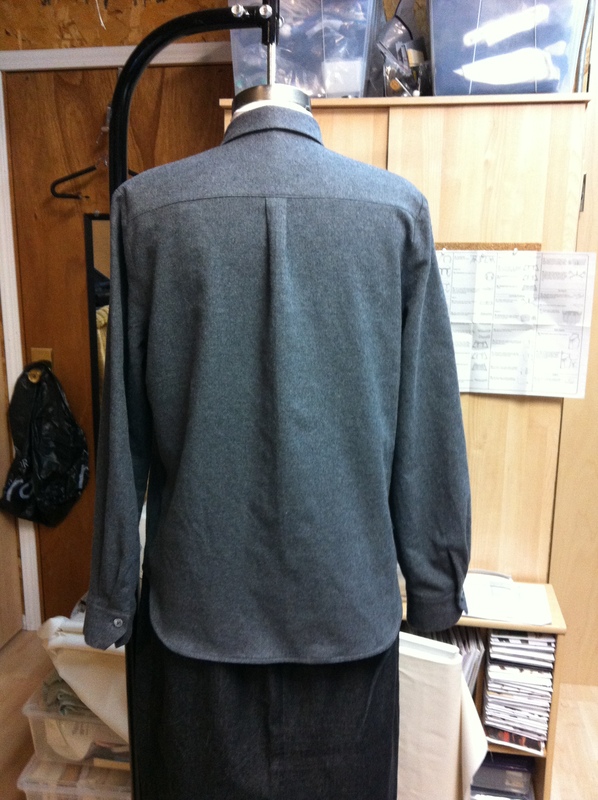 So, after finding an acrylic/cotton tweed I cut out the biggest single pattern piece I have ever seen. 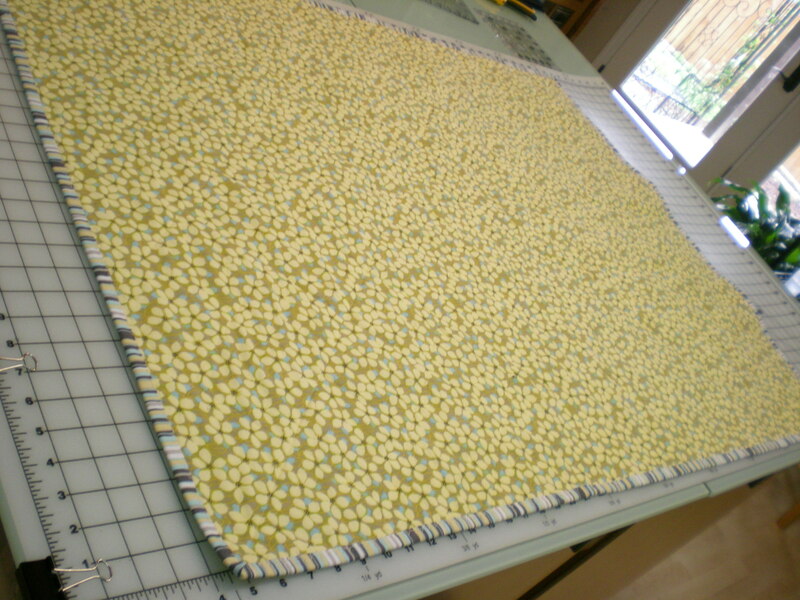 The body is all one big piece cut on the fold, out of FIVE YARDS of 60″ wide fabric. No wonder it looks so huge. I couldn’t get 5 yards of the piece of fabric that I found, they only had 4.75, and I thought hell I can make that work. Alas, you actually do need all five yards if you want to be able to cut the sleeves full length. I had to piece the cuff on because I was short, fortunately the tweed is really forgiving so you can’t even tell. 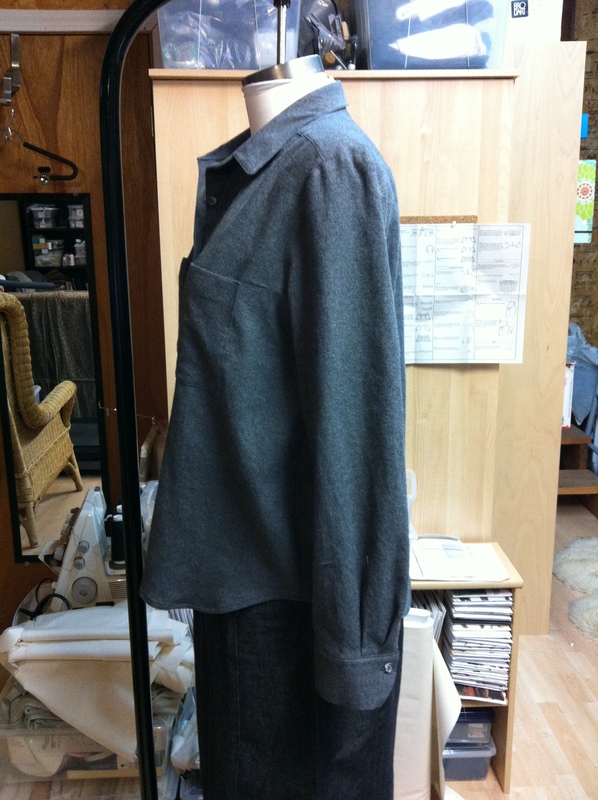 Here is the finished coat. It’s huge! 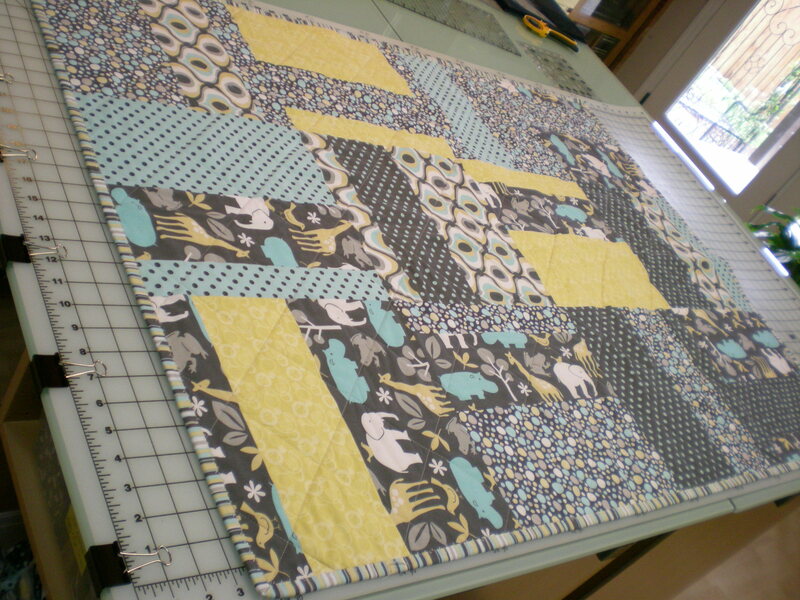 The baby quilt went together without a hitch. The stripy binding worked great and the backing fabric helped make it a little more girly since I went with a turquoise instead of the traditional pink. Here is the finished front and back. With some detail of the binding. Now… that damn Clay Tiles quilt. I’m still making progress but it’s become a grind. 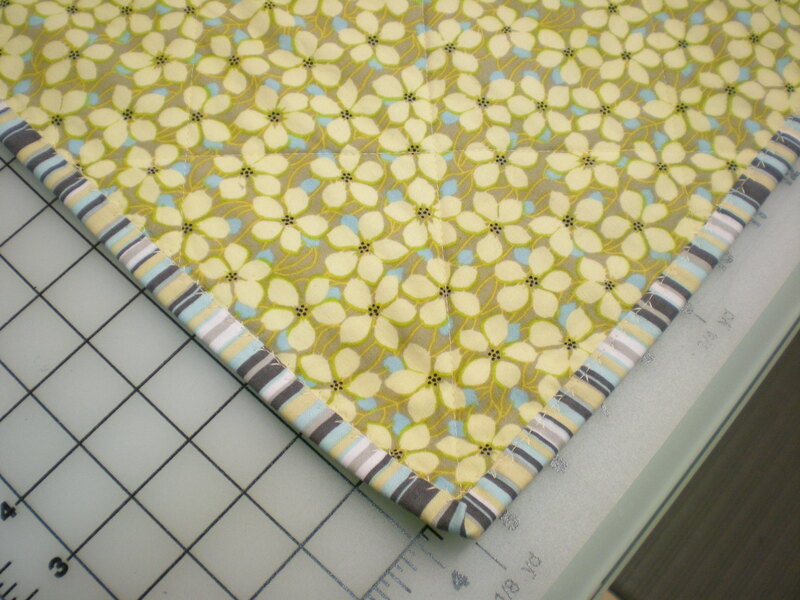 I can get about one row done on a good day, but I am mighty tired of triangles and tiny little seams. I will have to question my sanity if I ever decide to sew this particular pattern again. It is beautiful, but argh. Here is a progress shot, this is halfway done. It is really difficult to photograph but I will try to find some better way to shoot it for the next update. The piecing continues on the clay tiles quilt. I’m getting a system down but it will still take a while to get this one together. 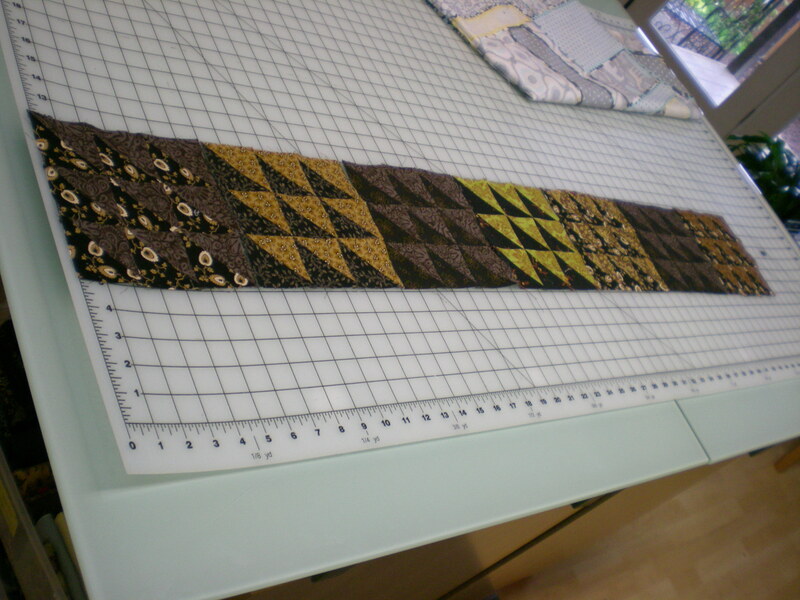 Here is a photo of one completed row. 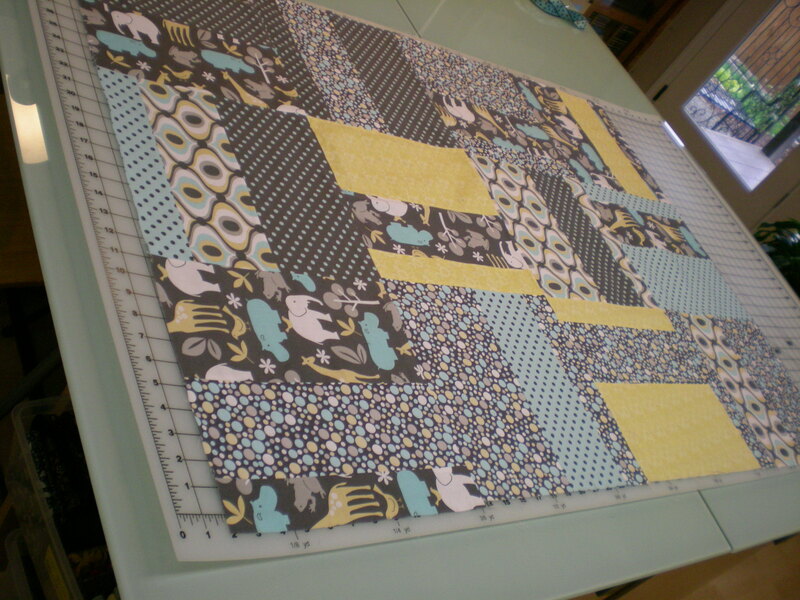 I’ve opted to wait until I have all the blocks together before I sew my rows together. I’m not sure if I want to make this a bit bigger than the original. 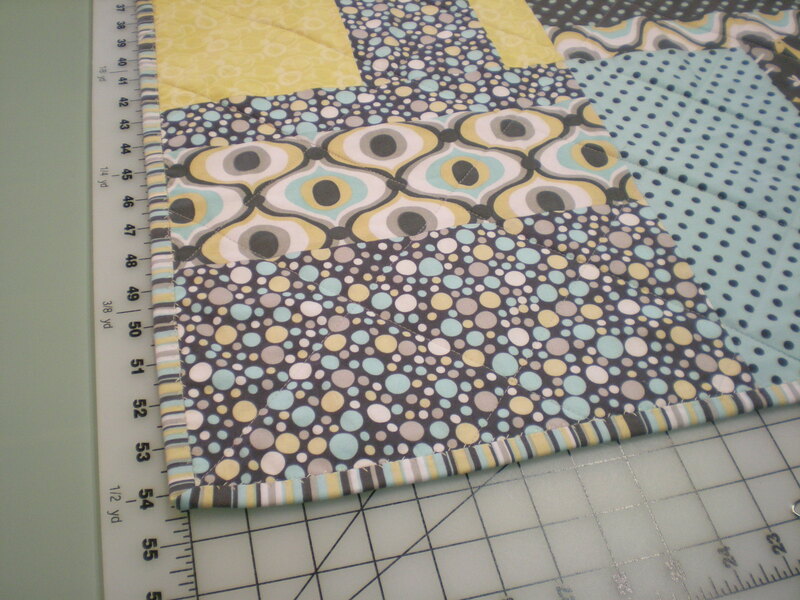 The baby quilt might be done today. 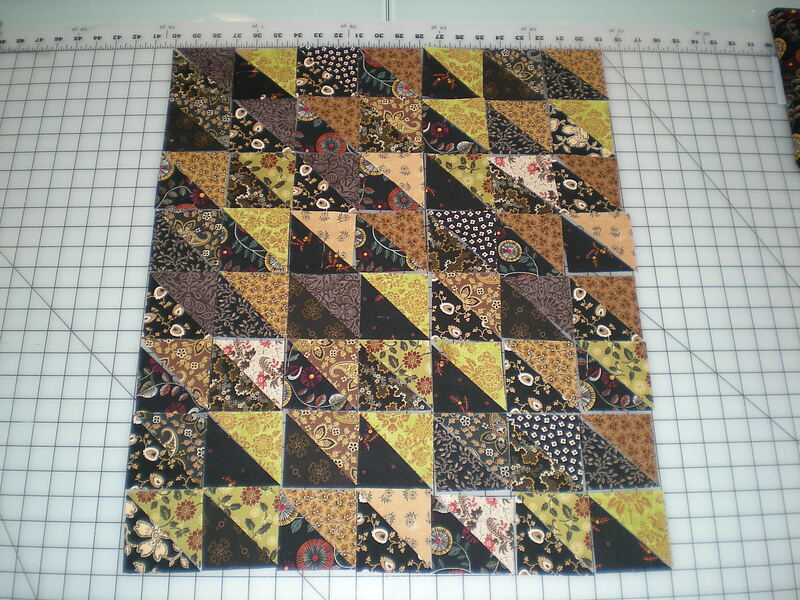 The top panel is together and I’m ready to start quilting. 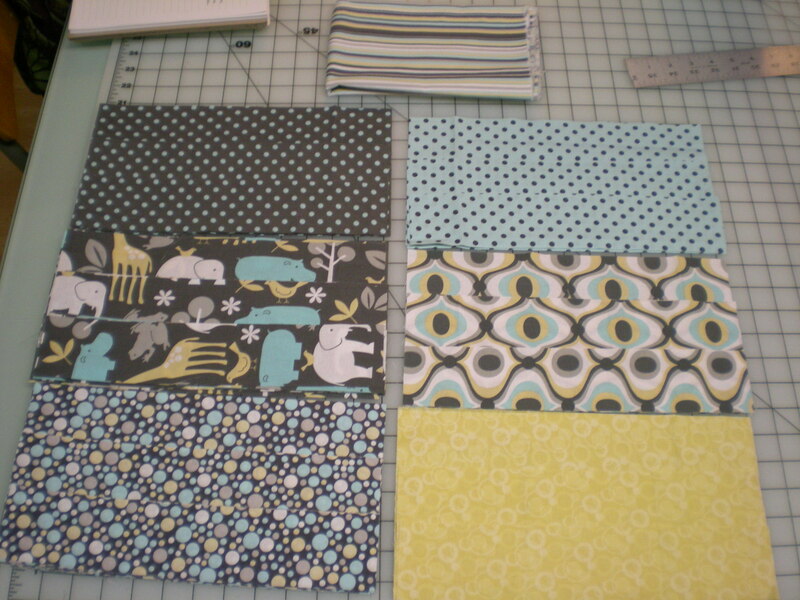 Here is the backing fabric and binding that I’ll use to finish this up. 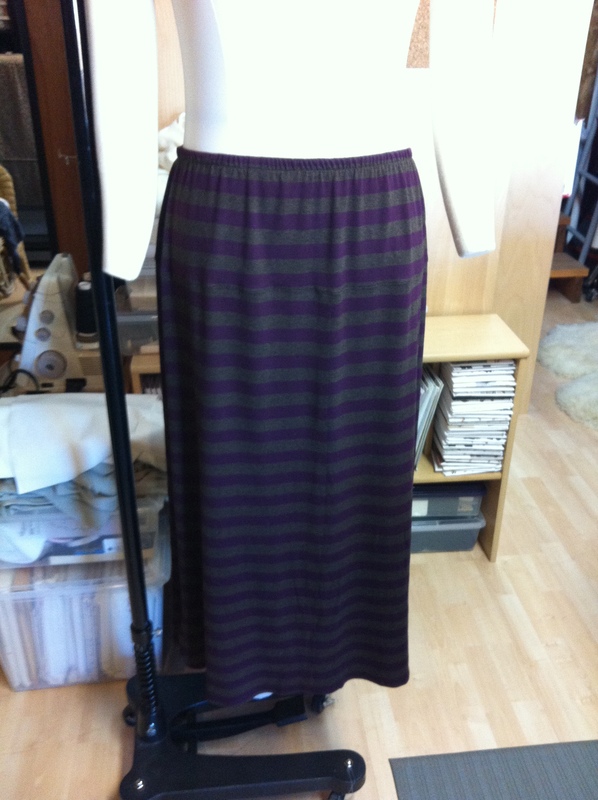 The striped fabric will be the binding. 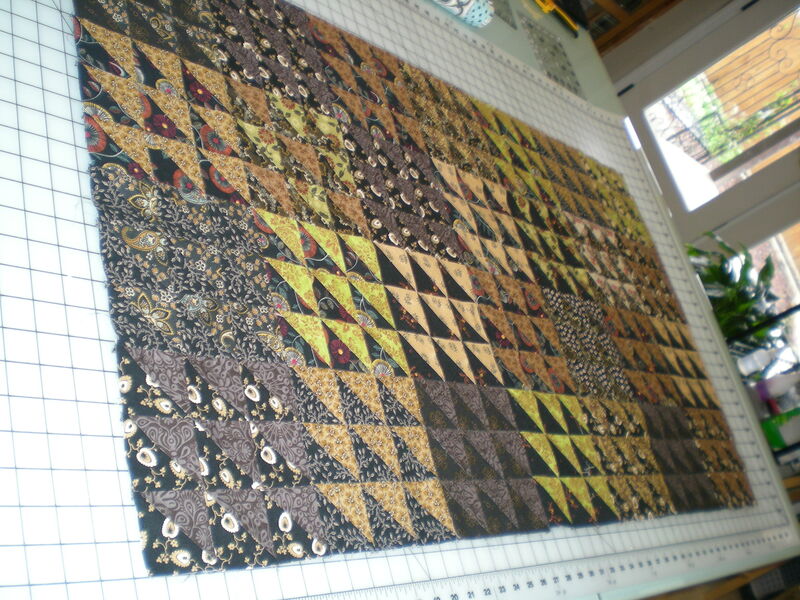 After many slices and dices, two new quilts are cut out and ready to sew. First is the mucho pieced clay tiles quilt. Here are all 504 squares which will become my 1008 triangles once these are cut in half. 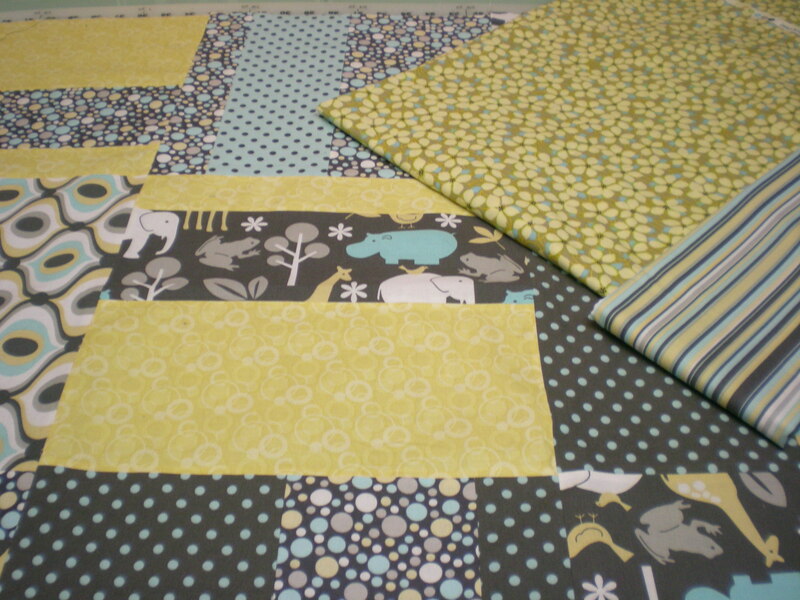 And another quilt project is in the works for my cousin’s new baby. I found this elephant print last fall and wasn’t sure what to make out of it. A baby quilt is just the perfect solution. 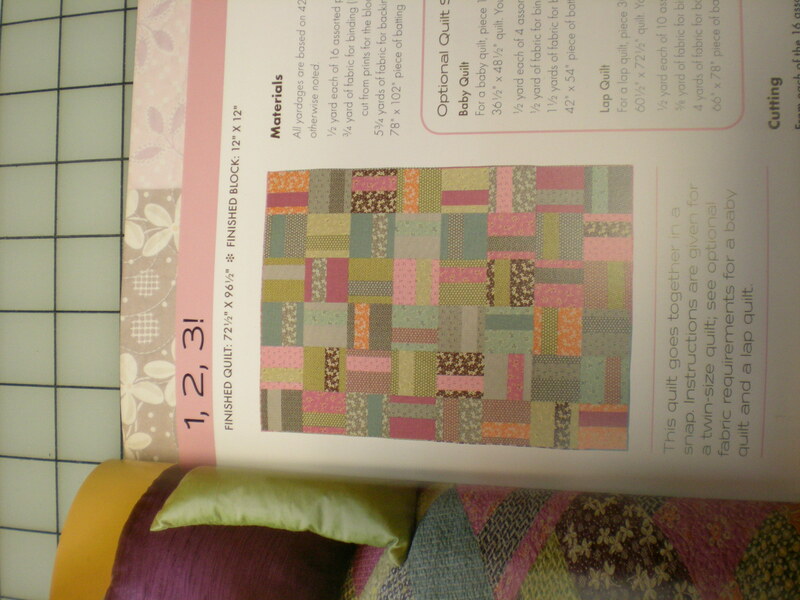 I’m going to do this very simple block quilt from the Modern Basics book. 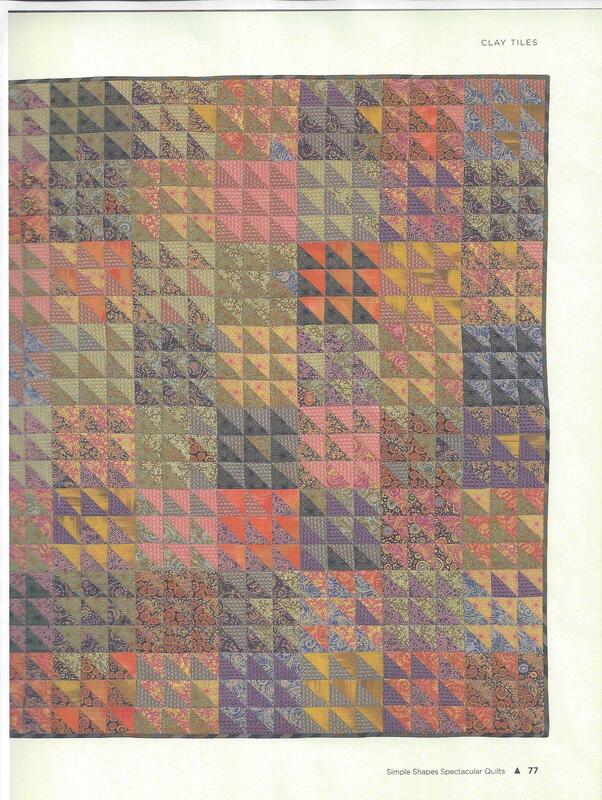 This is the 1,2, 3 quilt. 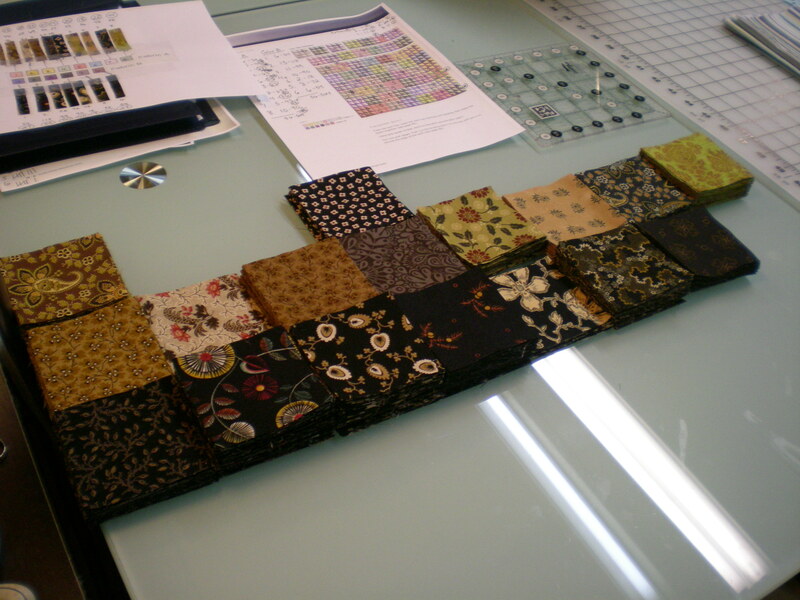 The next quilting project has started off taking hours of my life figuring out the pattern. I had no idea it would be this complicated when I picked the Kaffe Fasset Clay Tiles quilt from this book. 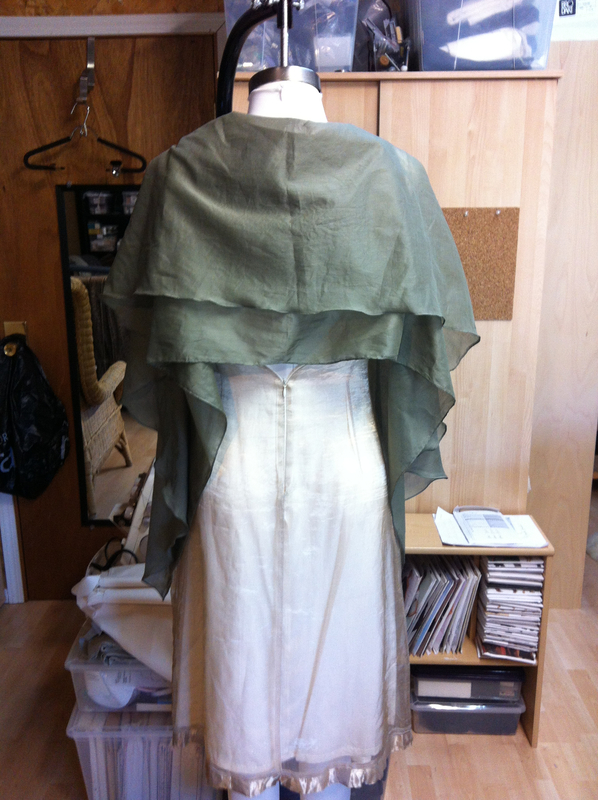 I laid out the fabrics in the grid to get an idea about the finished look and that’s where this got complicated. 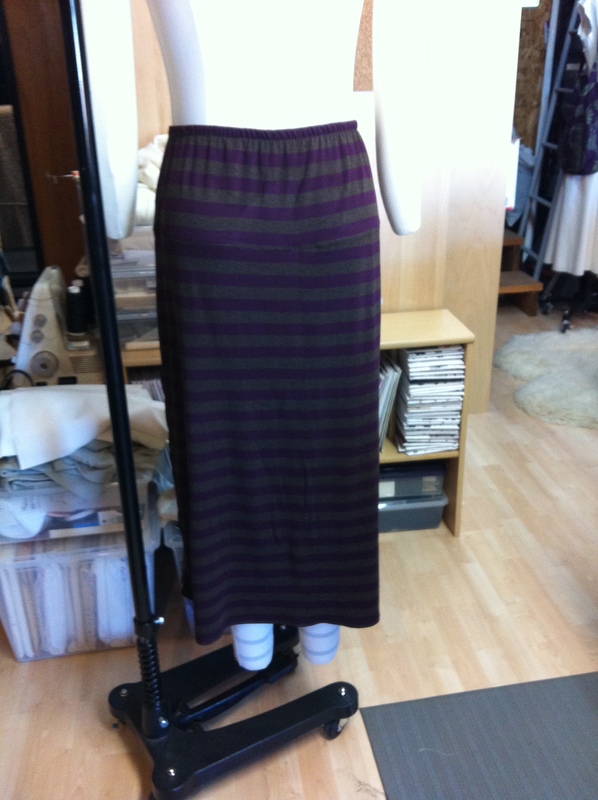 Two trips to the fabric store and hours of trial and error have led me to this design.